TURNERSVILLE, NJ – SolarWorks NJ, LLC, one of the oldest solar integrators in New Jersey, with proven expertise in designing, building, and managing small and large-scale renewable energy power projects, is proud to announce the completion of a solar installation at Barrington Professional Building. BarringtonProfessional Building, located on Trenton Avenue in Barrington, NJ has installed a 26.88 kW solar energy system offsetting 2 meters. The solar array will produce over 31,174 kilowatt hours annually, offsetting a combined 63% of their electric usage and cost. “We are pleased to be working with healthcare professionals in a lively community such as Barrington, NJ,” said SolarWorks NJ’s CEO Steve Masapollo. The system consisted of two phases. Phase I is an 18.816 kW system, producing 21,822 kWh’s and Phase II is an 8.064 kW system, producing 9,352 kWh’s annually. 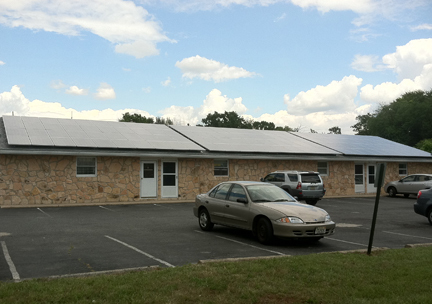 SolarWorksNJinstalled a total of 120 Sharp 224 Watt modules and 3 SMA Sunny Boy inverters. The array has a monitoring system that receives and stores measured values and data from the inverters. System owner, Dr. Jordan Goldberg, will receive a 30% Federal Energy Grant from the United States Treasury Department. “The Federal incentive was extremely important in making my decision on going solar. I was very concerned about the payback time of the system,” said Dr. Goldberg. The American Recovery and Reinvestment Act of 2009 allows taxpayers eligible for the federal business energy investment tax credit(ITC) to take this credit or to receive a grant from the U.S. Treasury Department instead of taking the business ITC for new installations. Construction must begin by December 31, 2011 to be eligible. Dr. Jordan Goldberg started Barrington Dental Associates in 1986. Specializing in Family and Cosmetic Dentistry as well as preventative maintenance and restorative dental health care for their patience, they are proud to be on the leading edge of using a renewable energy source. They believe healthy smiles and a sense of confidence go hand in hand. Maintaining a healthy outlook on life and a beautiful smile requires periodic professional care.